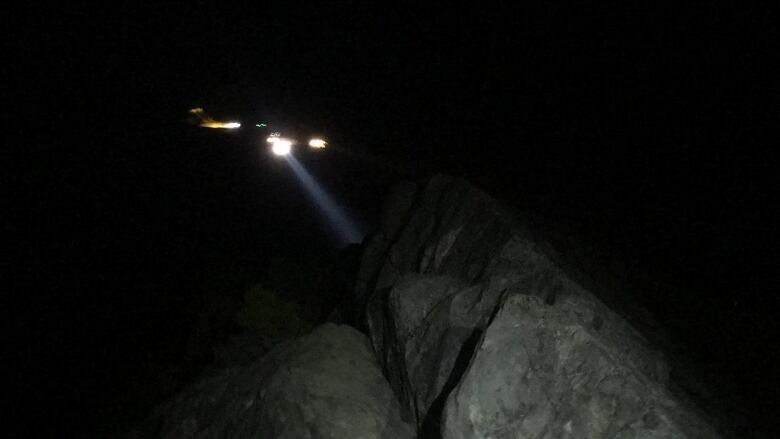 A solo hiker fell at least five metres after he lost his grip on a rope near the summit of Crown Mountain on Monday evening. A team of North Shore Rescue members spent the night on Crown Mountain after rescuing a solo hiker who was severely injured in a fall on Monday. The hiker tumbled at least five metres after he lost his grip on a rope near the summit, north of Grouse Mountain, around 7:30 p.m. PT. Another hiker heard his call for help and phoned 911. North Shore Rescue (NSR) leader Mike Danks said a team of rescuers and two physicians scrambled to get up the mountain. They found the 50-year-old hiker with "severe" injuries and decided he couldn't wait until first light for an airlift. NSR doesn't currently have a helicopter equipped for night flight, so the team called the military for help. The Joint Rescue Coordination Centre in Comox sent its Cormorant helicopter and the hiker was hoisted off the mountain around 12:45 a.m. PT. Meanwhile, five NSR members settled in for a night on the mountain. An NSR helicopter airlifted the group back down at first light on Tuesday. Danks said it's not often they call the military for help with a rescue, nor to have a team stay out overnight. "It was quite a call," he said over the phone on Tuesday morning. "We did everything we could just to optimize patient care and getting [the hiker] hoisted out last night was the right call." Danks said the hiker was lucky someone came across him after he fell, and reiterated the importance of hiking with a partner. "Would he have survived the night? Not likely. Would someone have found him this morning? Probably not," the team leader said. "It comes down to making sure you're with someone, letting someone know where you're going ... these things do happen."